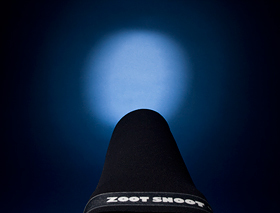 Control the light from your Speedlight quickly, easily, and effectively with the ZOOT SNOOT. 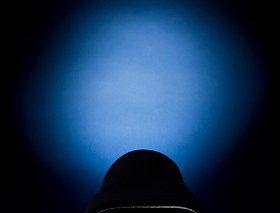 To use the Zoot Snoot just stretch it snugly over your flash head. You don't need fasteners or adapters because it has a built-in grip strip that helps keep the snoot in place. Once it's attached to your flash just roll back the end of the snoot to create a wider beam, roll it forward to narrow the beam. You can also control the light fall off with the Zoot Snoot. Leave the white to the inside and create a softer light. 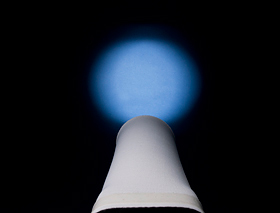 Turn your Zoot Snoot inside out (black to the inside) so there is less fall off and create concentrated beam. Use both Zoot Snoots (one inside the other) to create an even more focused beam. 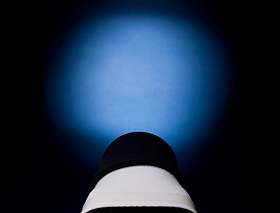 The Zoot Snoot is made of neoprene and will form creases when folded or compressed for long periods. This does not affect the utility of your snoot. However, if you wish to avoid creasing, we recommend using the buttonholes and supplied carabiners and attach it to your bag or light stand between assignments. The Medium Zoot Snoot circumference stretches from 7.25"-8.25" (18.5cm - 21cm) and is 9" (22.86cm) long so it works with the Olympus FL36/ Nikon SB600, SB800, SB24, SB25, SB26, SB28, SB50, SB80 / Sunpak 355, PZ40x, PZ30x / Sigma EF430 and more. 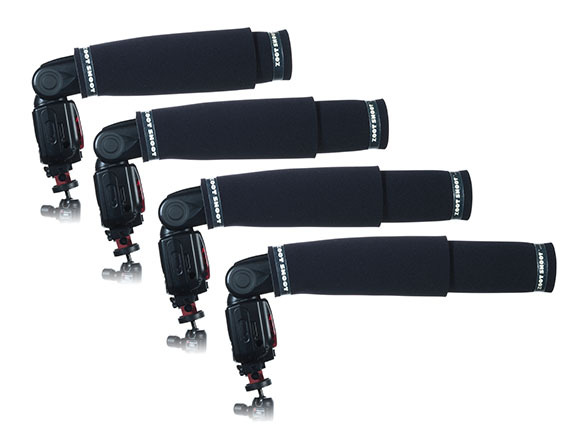 The Large Zoot Snoot has a stretchable circumference of 8.5"-9.5" (21.5cm - 24cm) and is 9" (22.86cm) long and fits the Olympus FL50 / Canon RT-600, 580EXII, 580EX, 199a / Nikon SB-5000, SB910, SB010 / Sunpak 440 / Vivitar 636AF, 283, 3500 / Pentax A540FGZ / Metz 54 / Minolta 5400 / Achiever TZ250 and many more. Just to recap, what makes this so cool? Adjustable length, Reversible reflectivity, Durable one piece construction, Secure fit, No fasteners or adapters, and Hey, it's machine washable. Not for use with continuous, or other high temperature light sources.